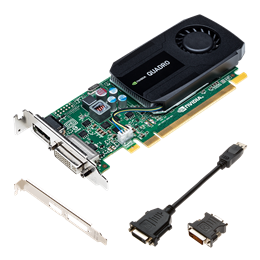 The NVIDIA Quadro K420 2GB delivers power-efficient 3D application performance and capability. 2GB of DDR3 GPU memory with fast bandwidth enables you to create complex 3D models, and a flexible single-slot and low-profile form factor makes it compatible with even the most space and power-constrained chassis. Plus, an all-new display engine drives up to four displays with DisplayPort 1.2 support for ultra-high resolutions like 3840 x 2160 at 60 Hz with 30-bit color. Supports a true cache hierarchy combined with on-chip shared memory. L1 and L2 caches drive exception throughput, accelerating features such as real-time ray tracing, physics, and texture filtering. Dedicated H.264 encode engine that independent of 3D/compute pipeline and delivers faster than real-time performance for transcoding, video editing, and other encoding applications (requires application support). The all-new display engine in the NVIDIA GPU drives up to four displays simultaneously, whether they’re directly connected to the board or connected using a single cable using DisplayPort 1.2’s new multi-streaming capabilities. With support for the next-generation DisplayPort 1.2 standard, each DisplayPort connector is also capable of driving ultra-high resolutions like 3840 x2160 at 60 Hz with 30-bit color. The flexible display connectivity of the Quadro family makes it easy to deploy multiple displays across a desktop, build an expansive digital signage wall, or create a sophisticated stereoscopic 3D CAVE environment. Experience interactive ray tracing through the power of mental images® iray®technology inside Bunkspeed SHOT™ software. See how the Design Garage demo for Quadro is built upon the NVIDIA® SceniX™scene management engine and uses the NVIDIA OptiX™ ray tracing engine, all driven by Quadro professional graphics solutions.